Rabbi at Eibenschütz; born at Frankfort-on-the-Oder in the second half of the seventeenth century. 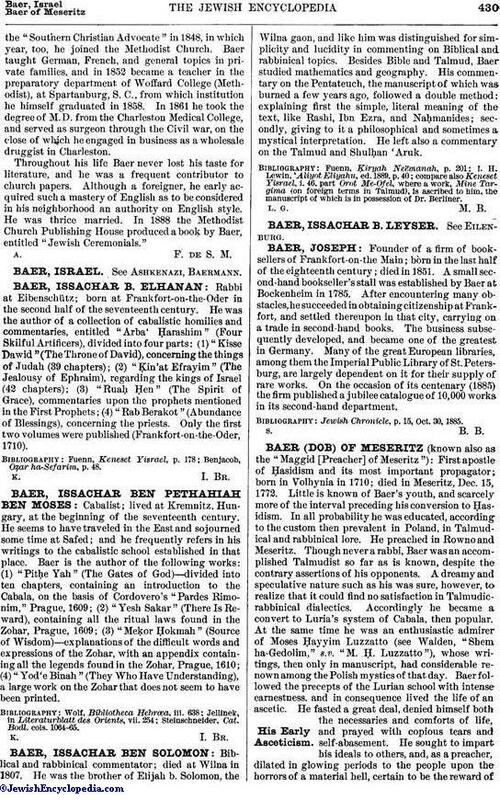 He was the author of a collection of cabalistic homilies and commentaries, entitled "Arba' Ḥarashim" (Four Skilful Artificers), divided into four parts: (1) "Kisse Dawid" (The Throne of David), concerning the things of Judah (39 chapters); (2) "Ḳin'at Efrayim" (The Jealousy of Ephraim), regarding the kings of Israel (42 chapters); (3) "Ruaḥ Ḥen" (The Spirit of Grace), commentaries upon the prophets mentioned in the First Prophets; (4) "Rab Berakot" (Abundance of Blessings), concerning the priests. Only the first two volumes were published (Frankfort-on-the-Oder, 1710). Benjacob, Oẓar ha-Sefarim, p. 48.